The current two most common laparoscopic approaches to inguinal hernia repair include the transabdominal preperitoneal and the totally extraperitoneal repair. Both the totally extraperitoneal and the transabdominal preperitoneal approach rely on the same concept introduced by Stoppa in the late 1980s (8). A prosthetic mesh is placed in the preperitoneal space covering and reinforcing the direct and indirect space of the inguinal floor. The only difference in these approaches involves the access into the preperitoneal space. The transabdominal preperitoneal approach requires entry into the abdominal cavity and incision of the peritoneum with creation of a flap, allowing access to the preperitoneal space. The totally extraperitoneal repair does not enter the abdominal cavity and allows for dissection only in the preperitoneal space. Angled scopes are mandatory when performing laparoscopic transabdominal preperitoneal. The medial umbilical ligament contains the obliterated umbilical arteries and the lateral umbilical ligament contains the inferior epigastric vessels. 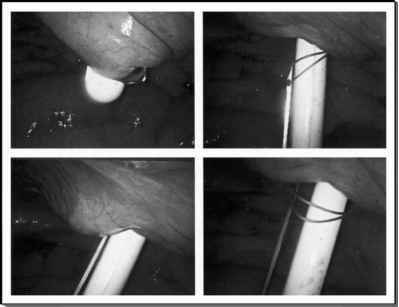 A direct hernia defect is identified medial to the epigastric vessels and an indirect defect is lateral to the vessels and follows the cord structures through the internal ring. The fat surrounding the cord structures, known as cord lipomas,should be identified and removed. If this is not accomplished, patients may feel a recurrence has occurred.